This is wonderful Connie, love the sentiment and cute chick! Loving the frame too. OH! I did laugh out loud with this, LOVE the "chick" and what you have done with her. Too stinkin' cute!!! Oh my goodness! I love that little guy and he made into a precious Easter card too. Love the expression on his face.....reminds me of myself today and wondering what's going on in life! LOVE your card Connie! 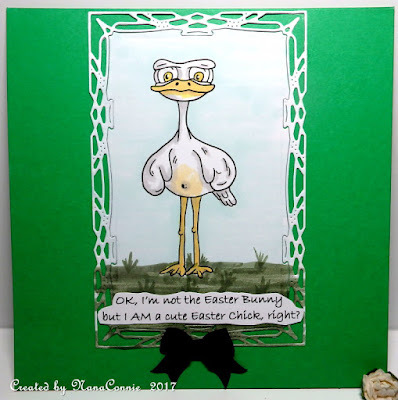 It's a very cute easterchick on your wonderful card. Such a cute and funny card. Thanks for joing us at AAA Cards.